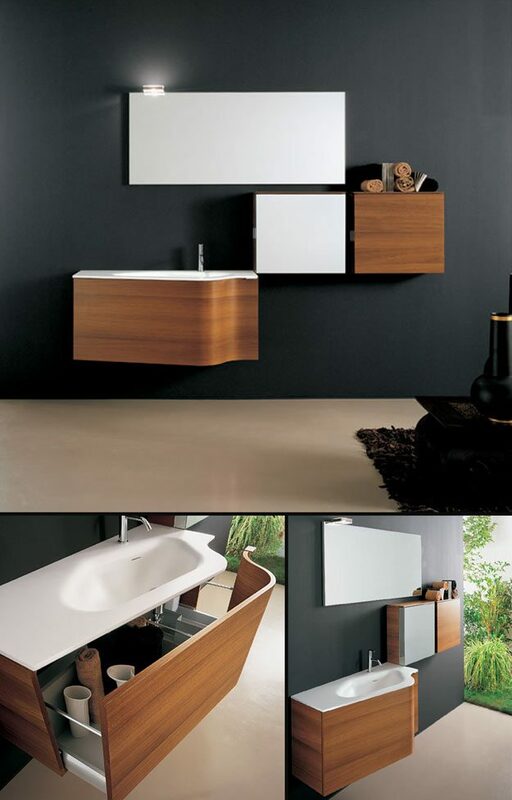 Top quality Italian design, the Klass Collection of luxury bathroom furniture will add style to any bathroom. Shown here is a contemporary curved wall hung basin unit finished in real teak wood and with a smooth soft closing sliding draw that offer plenty of storage. The vanity top is a one piece basin and worktop made in white Corian. We also offer matching optional extras including a frameless rectangular mirror with a minimalist light and wall cabinets in teak or high gloss white. Our wall mounted bathroom furniture can be supplied in other wood finishes and in matt and high gloss paint if preferred. The basin unit shown is right handed. Oak, wenge, white, cream, grey, black, chocolate brown, red, green, duck egg blue, orange plus bespoke colours. * Other colours & wooden finishes supplied.